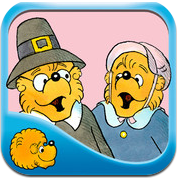 The Berenstain Bears Give Thanks is presented by Oceanhouse Media. The Bear Family creates a play for Thanksgiving. You can’t miss the heart warming end of this story! It is packed with Pilgrim and early time facts! Papa Bear delivers furniture in exchange for honey. The farmer has a surprise for him and the story begins! Wonderful lessons about gratitude, family skills, and more! As usual, OM book apps support early reading readiness with highlighted words and objects when tapped. This is a great tool for increasing kid’s vocabulary! You can also record your own voice and share the sound tracks. A page selector is a nice option when you want to go back and see the play! This is a Must Have Holiday App!